How come no one ever told me how hard finding a glider for the nursery would be?! Talk about options upon options...oh, and money. These things aren't cheap! I'm a review type of person. I will research the crap out of things on the internet before buying, and during my search for other gliders I found this one from Target that is exactly what we are looking for, but of course it has terrible reviews. Figures, right? I could always risk it and order it to see for ourselves since we would be saving almost $500, but is that the smartest option? 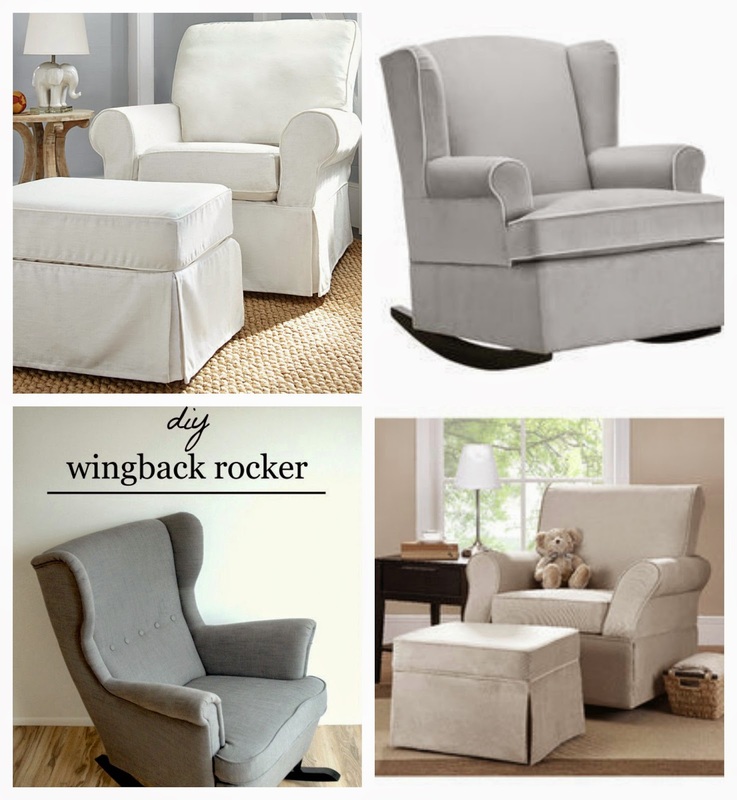 Then, there's this DIY wingback rocker tutorial that is catching my eye. I know Billy could handle this project, but is the chair comfortable? I don't know and wouldn't know until after making the two hour drive to our closest IKEA to find out. I've heard really great things about it, so it's an option. Aaaand then I found this awesome glider from Wayfair that looks really nice, is at an amazing price point, but is out of stock until September. If it's that popular though, people must really love it so it might be worth the wait (especially since we do have the time) to order it when it comes back in stock. But then again, I wouldn't get to try it out before buying which, again, isn't as appealing as the PB option. If you've been through the search of trying to find a glider before, any recommendations for me? What glider do you have? Any other gliders not on this list that you know about and love? Which one on this list do you think would be our best bet?! the glider search is a hard one! i ended up with a standard dutalier (sp?) type glider that my in-laws bought for us! it was easy to put together and seems comfy, guess i'll find out in november if it is. i REALLY wanted that ikea wingback and was going to attempt the same DIY, but it didn't seem easy for them to get (our ikea is an hour away) so this is the one we ordered: http://www.amazon.com/Modern-Glider-in-Dark-Grey/dp/B00B1BUSYU/ref=sr_1_97?ie=UTF8&qid=1401154541&sr=8-97&keywords=grey+glider the covers on the arms come off, so if you only want the seat and back cushions it could look a little more modern! Yo! Just my two cents here! So we have the glider that looks like a mix between a rocker and a glider...you've seen pics. Though it's still a good size, ours is probably one of the smallest on the market because it's not as wide, but because you have to place it really far away from the wall (to let it glide) it actually takes up A LOT of space in the nursery. We have an ottoman for it, but it would literally have to be placed in the middle of the room in order for the glider and the ottoman to function properly. Just think of how much room you will need and measure how big the actual chair is. It needs to be at least a foot to a foot and a half away from the wall so you don't bang up the walls with the back of the chair when you rock in it. Does this make sense?! We are planning on following this tutorial ( http://www.mrswigglebottom.com/2011/07/turning-chair-into-swivel-rocker.html ) for an Ikea hack to make a glider. I really wanted something comfy with a slip cover that I can wash. The tutorial seems pretty straight forward and I am hoping my super crafty husband can make it happen. Good luck! i found a dutalier one craigslist and love it! costco also had them last month! Not any cheaper but we got one from land of nod. I loved the clean lines and it would work in another room in the future. Whatever you do make sure you buy with a coupon. And if you don't have one you can always buy a 15-20% coupon for a few bucks on eBay. Worth it when making large purchases! We love our PB rocker. Its worth every penny. We also ordered an extra slipcover that is more neutral so that in the future we could use it elsewhere. Get the ottoman to go with it. The salesperson talked us out of it because they said "no one ever buys the ottoman". Well that is absurd because I still kick myself for not getting it. Happy shopping! the glider from wayfair is available at walmart. can you believe it??? walmart! I searched high and low for weeks! Gahhhhh, we are in this same boat. I never thought the stinkin glider would be the toughest decision! Just an FYI, we've sat in the PB chairs and they're uh-may-zing which is probably why the search is so hard, we are comparing everything to it. I ordered a different one, some babymod from walmart that was also sold out everywhere else. it gets here in a few days, and if it doesn't work I'm getting the wayfair one. sorry for the comment spam! We have one on our registry at Babies R Us that has good reviews. You are right! So many options and expensive! Can't wait to see which one you choose! You should check out My Own Room in Grandview. It's a children's furniture store and ths is where we bought our glider. The brand of glider is Best Chairs and you can pick from TONS of colors and fabrics. I absolutely love our glider and was cheaper than the PB one. Oh girl, I feel ya. I spent so much time searching for a Pottery Barn looking glider that didn't cost $1000! I'm happy to say that we love, love, love our glider. It's JCPenney.com, Best Chair is the brand, and with the right coupon code and free shipping, cost $400 total! Ours is charcoal, feels great, looks great and we found an ottoman that looks great with it at Target! See my nursery post on blog for more pics. Oh, and use ebates.com if you order it from JCP because they offer a good cash back percentage! It's been perfect! One thing to keep in mind when buying a glider - make sure the back of it is high enough for your husband to rest his head on. Some of them have shorter backs and so it's not comfortable to sit in for a long period of time (or fall asleep in). I had friends tell me that when we were looking because they made the mistake of getting shorter ones and hated it. (My cousin has one from PB and has that problem). But the glider from Target is tall enough for my husband to rest his head on. I lucked out and my grandma gave me a glider, but when we were looking it was a tough search. You should consider looking on Craiglist or Offer Up. I have some friends who've found their gliders on Craigslist in perfect condition! We ordered ours from Babies R Us after debating against the PB one and one at Buy Buy Baby. In the end, we just didn't want to spend SO much on it. We actually opened a credit card and had a coupon for 15% off so we saved quite a bit on top of a decent price. We got the ottoman for it as well and I'm happy with our selection (http://www.toysrus.com/product/index.jsp?productId=23701056&cp=2255957.2273443.2256245.2256276&parentPage=family). I know people who got expensive gliders and then didn't end up using them all that much because their babies just didn't like them! So I didn't want to spend tons of money on it off the bat not knowing! I've looked at gliders some & I agree, they're so expensive! Grr! I love the PB one but, not sure I can justify the cost of it. In searching though I did find the one that you found on Wayfair, online at Walmart. I was really surprised to find it there but, I think it's sort of the same situation as you can't try it out... it's an order online only type of thing. I know it's a hassle but, you could always return it if need be (as apposed to the DIY option). This one is the best! http://www.westelm.com/products/graham-glider-g667/ It's super comfy, has a high back and sides to rest your head on and the arm rests are a great height for feeding. It also goes on sale and you can use coupons! I love the gliders, but you're right - they are so expensive! We just went with a smaller wooden glider, since his nursery is pretty small anyway. But man, on nights where I wish I could pass out in his room, I wish we had a glider! We have the PB rocker you posted above and LOVE it! We have used it daily for the past 15 months and it still looks brand new! We chose a dark grey linen for the fabric and it is great, works well in our nursery and will transition into our living room (with the stationary legs) once we are done with babies. We did not get the matching ottoman as I found it easier to nurse using a stationary step stool (versus having my whole body move). We love this chair and would highly recommend it. I also found that having the chair with the wingback sides to be helpful as you will fall asleep in it (especially during the first few months) and it was comfy to have a place to rest my head. I sat in the PBK glider and it was really comfortable, but I didn't want to pay the price for it! Also, I'd heard their chairs were pretty overpriced for what they were. I found a comparable chair at Buy Buy Baby, both looks, size, and comfort wise. It is called the Little Castle (brand) Treasure recliner. I can't find it on their website, unfortunately, but if you can go to the store see if they have it! I ordered a matching ottoman and it will probably take up the whole room, ha. I like Buy Buy Baby because you can always use a coupon (theirs or a Bed Bath & Beyond). Oh man the great glider debate I remember it all too fondly! (insert sarcasm here) I was all about the Pottery Barn wingback rocker chair but the price was less than appealing. David decided he liked the glider motion better (but we both were not a fan of a traditional wood glider). We ended up with a chair from Buy Buy Baby that so far is pretty comfortable -I can give you a better review in less than two weeks! Here is a link to the chair but it's at Buy Buy Baby and the nice thing is all the fabric options! That is just the style we didn't get that color and kept the piping the same color as the chair. Check out COSTCO.com!!! We ordered our rocking chair from there and it's SO comfortable! Perfect for the nursery! We went with the Tryp from Buy Buy Baby and I absolutely love it so far! I live in it- that's where we do any night feeds and read books and just hang out. It's so dang comfy. It doesn't have an ottoman, because we opted to go with a chair that glides, swivels, and reclines. I really wanted to get a chair that can be repurposed somewhere in our home after we're done with the baby phase! Good luck finding your favorite :) Keep in mind most chairs take 8-12 weeks to come in if you have to special order them. We actually got our glider on All Modern, but truthfully, we have our very first and she's almost one month old, and we have yet to use our glider - whoops! We're having the same debate in our house. I have done a lot of research and found two reliable sources in Lucie's List and the trusty Baby Bargains Book. They both say Dutailier Gliders and Little Castle Glider are comfy, affordable options, and so is the Land of Nod Luca glider, which is also pricey but less than the $1,000+ that PBK is asking. Can't wait to hear what baby K is...we find out our gender tomorrow! Our home is really a sweet home. To get more decorating room you can add a leather sofa recliner. You can pas a relax time on recliner with your family. Recliners are now became very popular. It's easy to use and also very easy to carry. Recliners are also take less space because of that i always prefer best recliners reviews. My family members are also very happy to use recliners.